One of the beautiful sites we enjoy during winter in Alaska is when big snowflakes float down from the sky, covering the Great Land with a fresh, clean white. And who in Alaska hasn't watch a night time snow storm as snowflakes descend through the soft illumination of a street lamp? Fresh snow is wonderful for skiing and sledding and walking through snow covered forest. But there is another side to a big, heavy snow storm. The video above was shot during a snow storm in the 1970s by videographer and editor Michael R Dougherty (that's me) and engineers Joe Gill and James Chafin for the KAKM channel 7 magazine show "Southcentral". Part of the video was shot from high above the Anchorage Alaska streets in a top floor of the Captain Cook hotel. We kept warm, dry and got some great footage without having to slog through the drifting white. As you see in the video, while huge snow storms are a beautiful Alaska scene, they also bring a host of problems. How many times have you helped push someone's car when they got stuck in the snow? And how bout shoveling snow out of your drive way, or brushing snow off your car's windshield like the lady in the video? And here's a new one I bet you have never thought of - I know I hadn't. 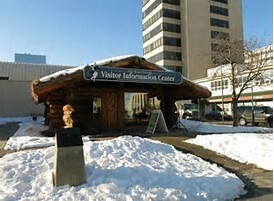 While I was shooting one scene of this video by the Anchorage Visitor's Log Cabin on Fourth Avenue, a big fluffy snowflake landed on the electric connection of my camera's zoom lens. Suddenly, my camera lens wouldn't stop zooming in and out. To clear the problem I blew into the connection and wiped it dry with my shirt tail. Yes, the snow storm even affected my video camera. As you watched the video, did you notice how Anchorage Alaskan's just keep on "keeping on" even during a big snowfall? There are people walking about, catching the bus, and driving along Fourth Avenue just like it was any other day. I don't recall how much snow fell on Anchorage and vicinity that day, but I'm glad we captured at least part of it on video. And I imagine that following the storm, local hillsides were filled with happy families and kids enjoying a fun time sledding. That cross country skiers were happily dashing over Anchorage trails while downhill skiers flocked to surrounding slopes. Happy memories being made as Alaskans enjoy one of the things that makes Alaska - Alaska.